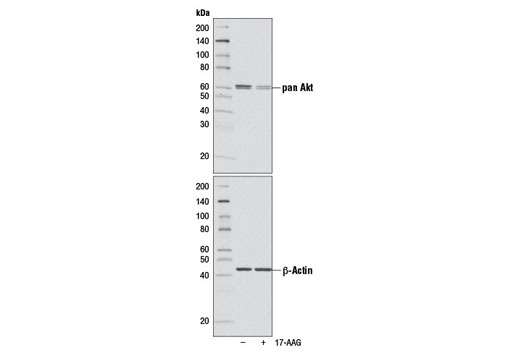 Western blot analysis of extracts from LNCaP cells, untreated (-) or treated with 17-AAG (1 μM, 24 hr), using Akt (pan) (11E7) Rabbit mAb #4685 (upper) and β-Actin (13E5) Rabbit mAb #4970 (lower). 17-AAG is supplied as a lyophilized powder. For a 1 mM stock, reconstitute the 500 μg in 853.7 μl DMSO. Working concentrations and length of treatment can vary depending on the desired effect, but it is typically used at 0.1-1 μM for 4-24 hours. Soluble in DMSO at 150 mg/mL; soluble in ethanol at 5 mg/mL. Maximum solubility in plain water estimated to be about 20-50 μM. 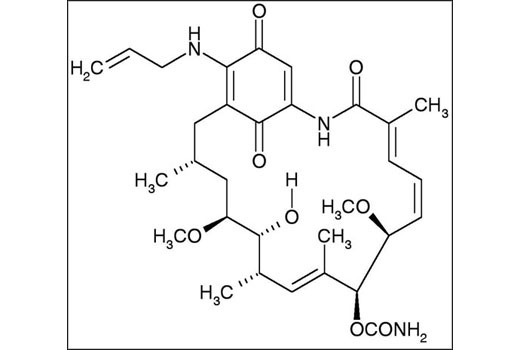 17-AAG is a semi-synthetic derivative of geldanamycin, demonstrating greater stability than its parent compound (1). It binds specifically to heat shock protein HSP90 in a manner similar to geldanamycin, but with weaker binding (1). Through specific binding with HSP90, 17-AAG has been shown to decrease levels of many proteins including androgen receptor (AR), HER2, and Akt, while increasing levels of HSP90 in prostate cancer cell lines (2). 17-AAG binds to a conserved pocket in the HSP90 family of chaperone proteins and this occupation causes the degradation of several signaling proteins (2).